These flowers look like they're difficult to make but they're not! I made them while watching TV. This would be a great project for older kids to do. 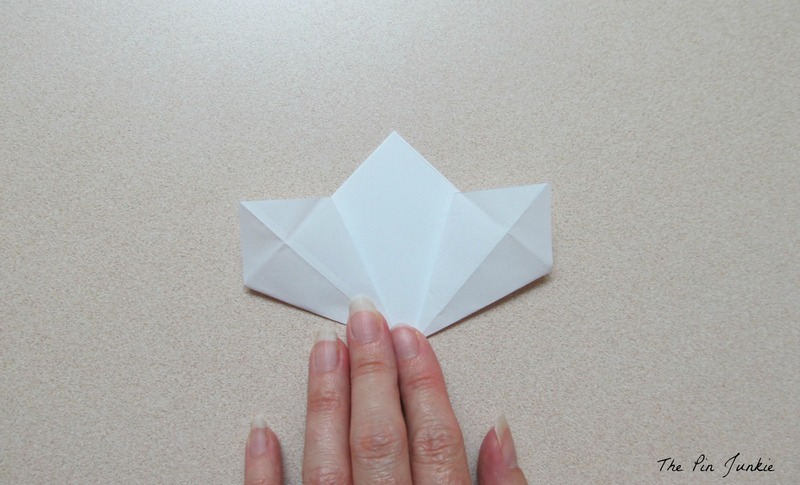 Once you know how to make the basic fold, you just repeat it five times to make a whole flower. To do this project you will need paper, invisible or matte tape (not glossy) and wood skewers. 1. Start with a square piece of paper and fold it in half diagonally. 2. 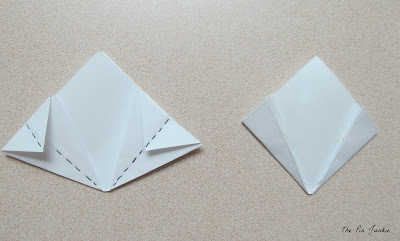 Fold each corner up. 3. 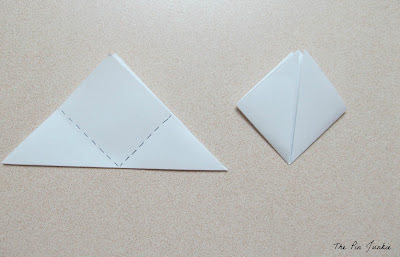 Fold each triangle in half so the tip points out. 4. 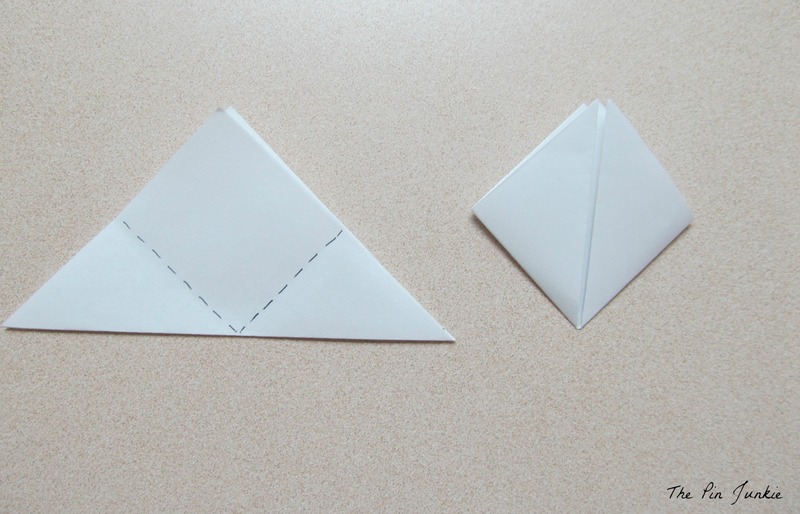 Fold the tips of the triangles down. 5. Unfold. 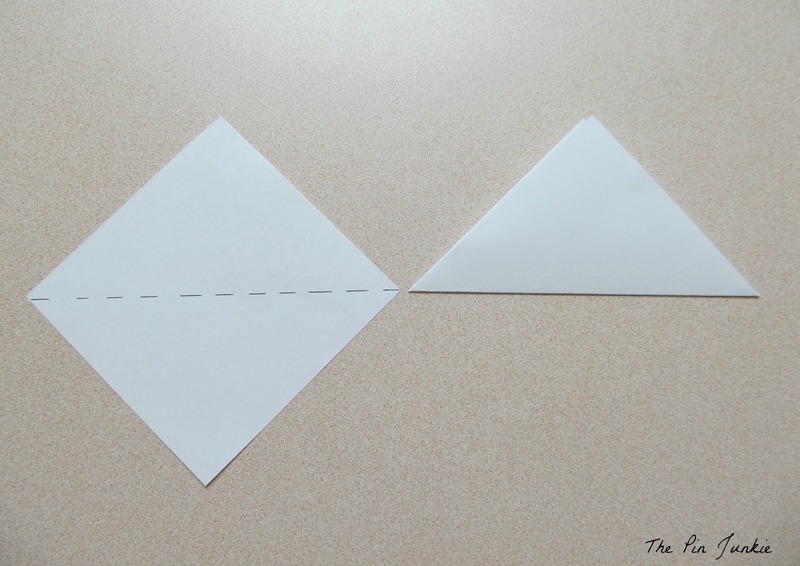 With one hand, hold the triangle closed. 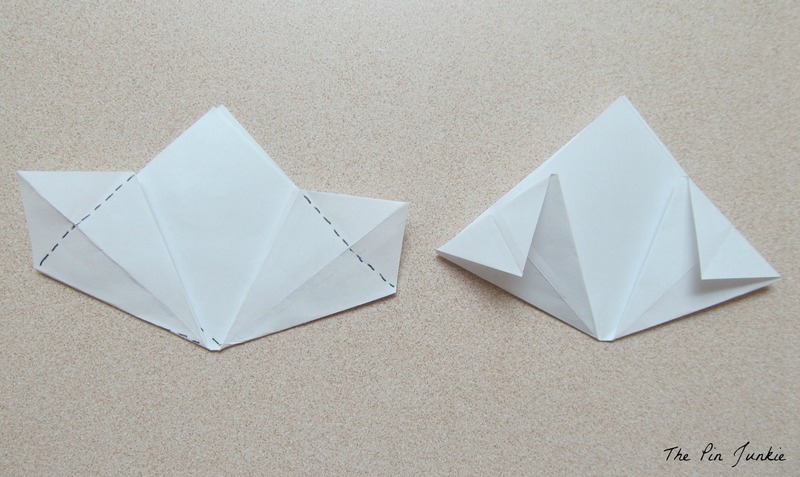 With the other hand refold on the existing fold lines. Repeat for the opposite side. 7. 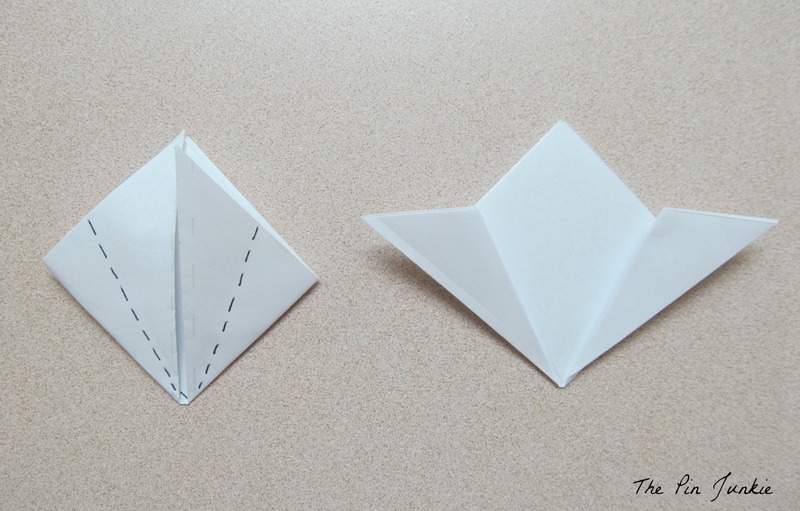 Fold the tips down again. 8. 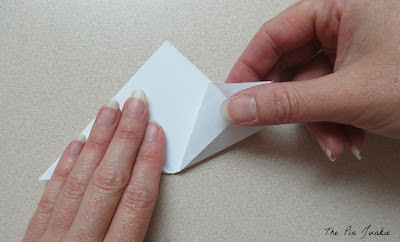 Fold the corners in. 9. Roll and tape closed. This is the first petal for your flower. You will need to do this four more times to make a total of five petals. 10. Now tape each petal together. 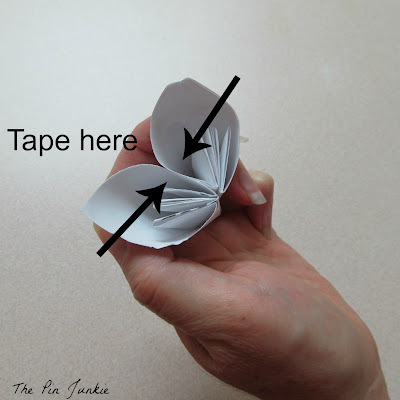 Keep taping each petal together until you have a five petal flower. It's best to use invisible or matte tape so you won't be able to see it. Glossy tape will show and won't look as nice. 11. Tape the petals together on the back. 12. Poke a wooden skewer into the flower for the stem. It should look like this when you're all finished. You can stop at one flower or make a whole bouquet. You can also change the size of the flower by using different sizes of paper. 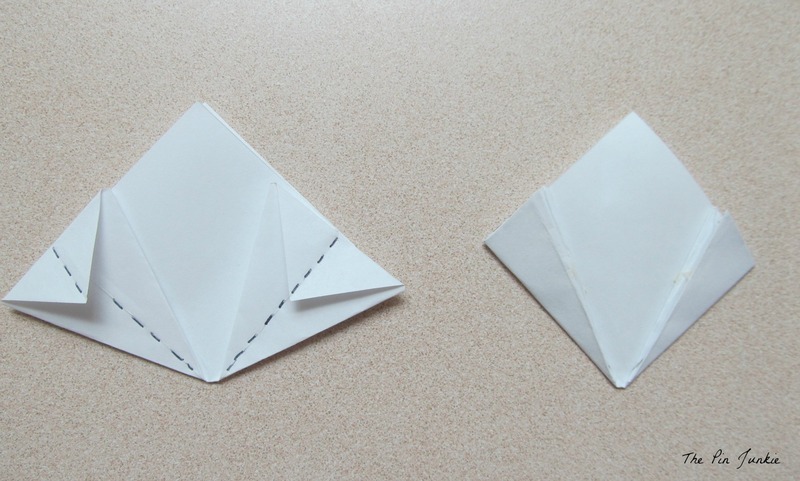 Small squares of paper will make small flowers and large squares of paper will make large flowers. You can also tape several flowers together to make a cluster or ball that you can hang. 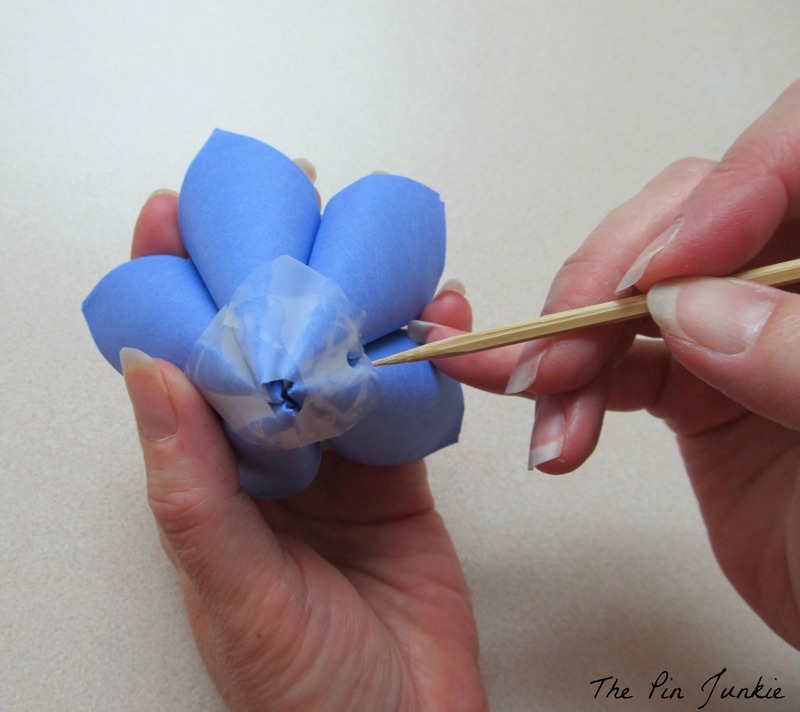 Inspired by this pin for paper flowers. Love this! And no wilting! ;-) Thanks for linking up at LOBS. Always good to see you. 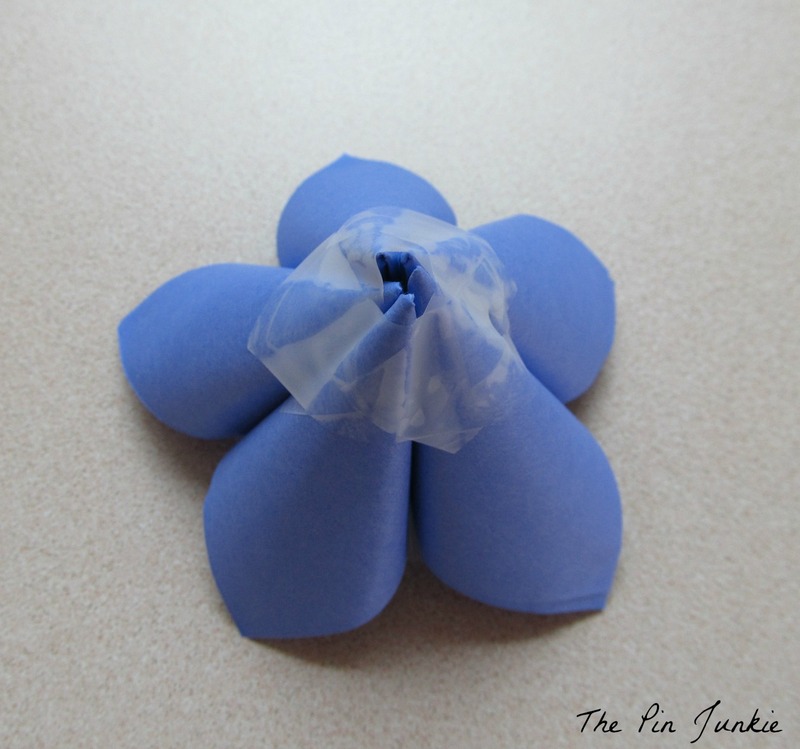 Stopping by from Sunday Social :) This flower is gorgeous and it's so simple to make. It would be perfect for decorations at a party. Amazing paper flowers! Thanks so much for sharing the great tutorial! So pretty! These are just great. Thanks for sharing at I Made It! Monday. Can't wait to see what you link up this week. Cool, I pinned this. Your display looks so pretty! Very pretty! I've made a bunch of paper flowers before - they can look so pretty! I'm pinning this version to try too! So pretty in blue and white...would match my kitchen perfectly! Pinned! And following you on Pinterest! My favorite color is blue and I love blue and white together. What a beautiful flower arrangement. I could see doing this in the winter when I don't have any flowers for a fresh bouquet. Good idea Tammy! I hadn't thought of that! Lovely flowers, thanks for the tutorial. Beautiful flowers, thanks for the tutorial! I've always wondered how to make these! It looks so good! I love origami. And I was juuust thinking the other day that I wanted to learn how to make a flower (not even kidding). But then I forgot to look it up. And now I don't have to. I'm definitely doing this today while the baby's sleeping. Thanks!! This is one of prettiest paper flowers I've ever seen. There are many examples out there. These look a bit more complex but I've challenged myself to try it. My hands and eyes don't always work too well together any more but I like to try it anyway. I'm sure granddaughter could do in her sleep. I'll have to read it again to see what kind of paper you used but it will be little while before I can make them. Have to get some more ink cartridges as mine are pretty gone. I have to make my cartridges last from one SS payday to another and we've had nothing but 5 weeks between so it's not easy always to make it stretch. There's so much to print out. I keep notebooks for specific subjects, put pages in plastic page protectors and then in their own notebooks. Keeps me busy just filing all the projects I print out. Great project. Glad you shared this on Tutorials and tips link party. That does look fun, and not too tricky. Beautiful! Do you have to use a particular paper? Will scrapbook paper do? I just used regular paper you would use in a printer. Any paper would work as long as it's not too thick. Thick paper will be difficult to fold. I think scrapbook paper would be a lot of fun. You can really play around with different patterns, colors, and designs of paper to change the look of the flowers. These are beautiful! 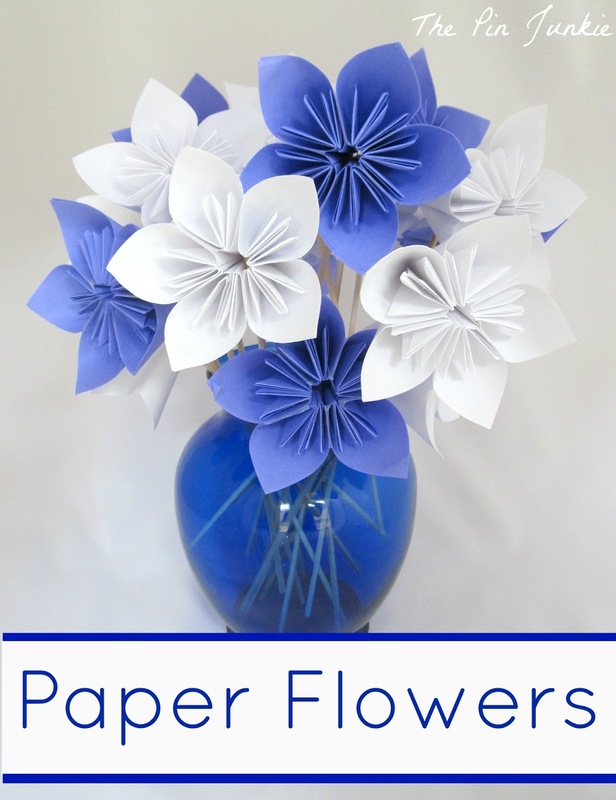 I have never made paper flowers before but these are so beautiful I will have to give it a try. You did an amazing job on these! These would be incredible with patterned paper too! I'd love if you joined our link up party this week! Only one day left to enter! Thanks for the invitation Randi! I linked up. These are fabulous! My kids are going to love making this! These are pretty! I made these exact flowers for my wedding bouquet using scrapbook paper. I made the whole ball with them though. What a great idea! I'm sure it was beautiful! Really cute! What a great craft to change out with different colors! Wow, this is elegant! Had to pin it and saved the link to learn how to DO it, too! Thanks for sharing this link on Wonderful Wednesday Blog Hop. Great idea! These would be cute for gift wrapping too. Good idea Stephanie! I like it! So so Pretty, I love paper flowers in all their styles LOL. There are so many kinds we can make and decor our lovely homes. Thanks so much for sharing this with me at Bewitch Me & Titi! Hope to have you back tomorrow with more awesome shares! Hope you are having a lovely day!!! So pretty! What a great craft! Thank you so much for sharing at Give Me The Goods Monday! Sp pretty and great tutorial! Really cute. They would be so fun for a party! Thanks for sharing with SYC. These are beautiful! Thanks for sharing the tutorial, so I can give them a try. Thanks so much for the feature Kim! Pinned to my 'paper crafts board' @ catchacreation on Pinterest. Hi Bonnie! 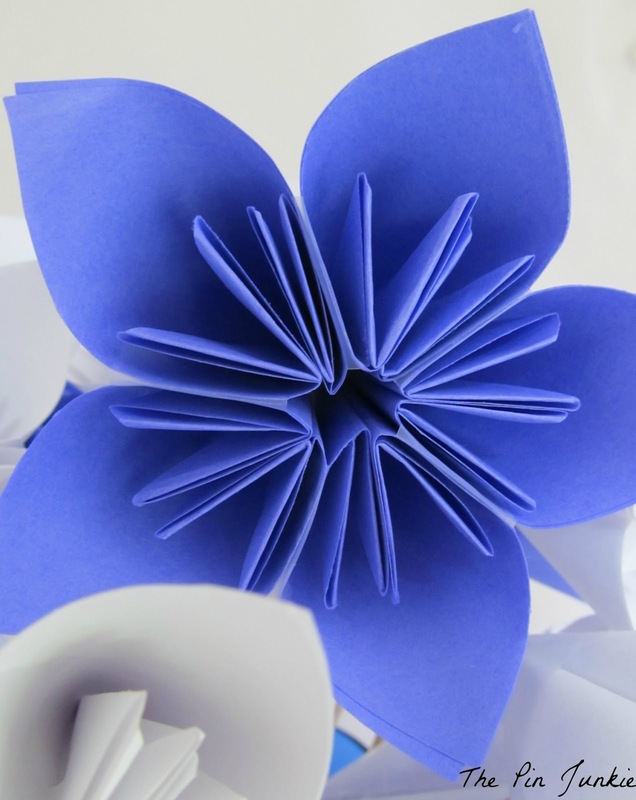 These paper flowers are just wonderful! 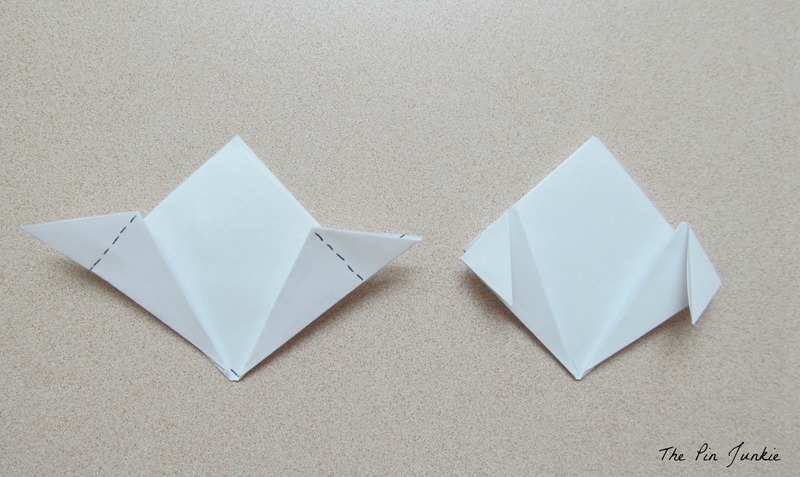 It reminds me of when I was younger and I used to do origami. I will definitely have to give this a try =) Just stopping by to let you know that your paper flower tutorial has been featured at this week's Get Crafty Friday link party! Thank you for sharing with us and I hope you have a wonderful weekend! Thanks so much for the feature Amy! How darn cute and I love the colors. Thanks for sharing at Throwback Thursday! What a great tutorial! These are lovely. 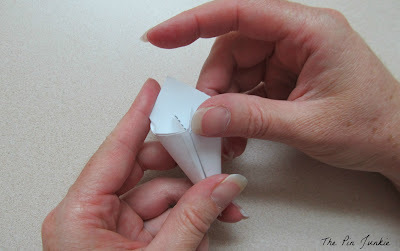 Thanks for sharing on the Spring Craft Blog Hop! It is awesome! Thanks a lot for sharing your ideas. Extraordinary!!! Simply loved the outcome! Perfect valentines gift!!!!!!!!!!!!!!! I made one out of red silk and golden paper! Turned out great! THANK YOU!. by far the easiest tutorial that I can follow! !